As today is April Fool’s day, a.k.a. the day of jokes, we decided to share with you some funny commercials. This one is made by the University of Winsconsin Madison, for the Copper Gable Café, advertising for their burritos. In the picture you can see what looks like a messy flat, probably after a big party: some bills falling out of the bag, high-heeled shoes, a glass spilled on the carpet, pills, etc. And in the middle, there is a big fat burrito. 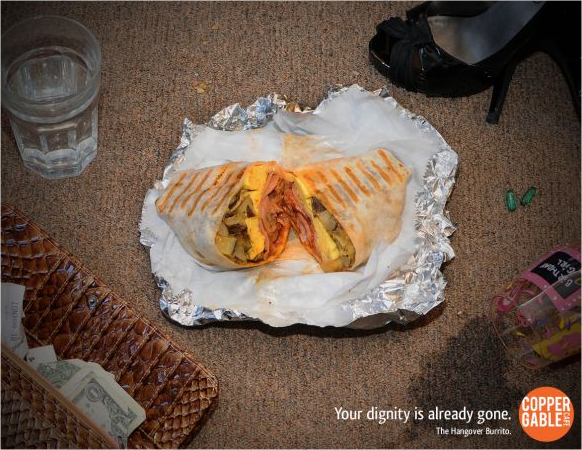 At the bottom of the picture, the slogan claims “Your dignity is already gone. The hangover burrito.” It’s quite a funny and interesting commercial as it is targeting people suffering from a hangover. Indeed, we all know that after a drunken party we look like hell, have a more or less big headache, and like to eat something fat in order to sponge the alcohol, which makes us feel better (I guess some of you know what I mean, huh? ), the fat burrito seems to be a great compromise. No doubt that this ad has been made by students! Another funny ad, which is currently broadcast in France, is for the new Citroën C3 HDI. This commercial is a success in the country, as it is quite attractive by its humor. There is a man driving an old car, miming all the noises that a more recent car with many options would make: GPS, seat-belt, and especially the alarm at the end. Watch and enjoy!